We launched a new blog called the Nature of Food! Link here. Check out our new publication that asks, "How much of the world's food do smallholders produce?". Link here. New publication! "Detection of cropland field parcels from Landsat imagery". Link here. "Many shades of gray—The context-dependent performance of organic agriculture​"- the latest research out of the LUGE lab has just been published in Science Advances. An opinion piece is also available on The Conversation. "What is this thing called organic? "- the latest publication from the LUGE group is now available online. A paper led by Corey Lesk, who was an undergraduate research assistant for Navin during his McGill days, has just been published in Nature. Using reported extreme weather disasters from 1964-2007, the authors examined the effects these events have had on crop production at the global scale. Amongst their findings, they show the negative impact that drought and extreme heat events have had on agricultural production in the recent past, and that these events have a greater impact in developed countries. The paper is already receiving a lot of coverage in the press (McGill,UBC,New York Times). Congratulations Corey, Pedram, and Navin! Navin was recently invited to discuss agriculture in the context of climate change on TVOs The Agenda. You can watch the interview here. The first PhD out of the LUGE group, congrats to Jean-Sébastien for successfully defending! A very proud day for Navin as well, as it is his first PhD student to defend. Congratulations to Thomas for successfully completing his MSc! He will be missed by the LUGE team, and we all wish you the best of luck in your next adventure! We will be welcoming two new students this coming fall: Vincent Ricciardi, who will be starting a PhD, and Kalifi Ferreti-Gallon, who will be starting a MSc. Also joining us is Zia Mehrabi, who will be joining the lab as a postdoc. A warm welcome to you all! Congratulations to Navin, who has just been selected as one of the 2015 Leopold Leadership Fellows! He will be one of 20 North American environmental researchers participating in this year's program, which offers intensive leadership training in the areas of science communication and stakeholder engagement. You can read more about the program here. Way to go Navin! Navin is taking up a faculty position at the University of British Columbia starting July 1, 2014. He will be cross-appointed at the Liu Institute for Global Issues and the Institute for Resources, Environment, and Sustainability. The LUGE lab is making a transition: Some people are moving to Vancouver with Navin, while others are saying goodbye. We are all sad to be ending our nice story in Montreal, but also excited about new beginnings in Vancouver. 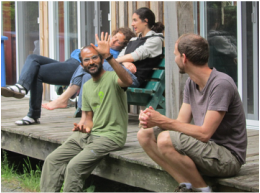 Our lab had one last hurrah - we went on one last 'retreat' (okay, we went for a hike and an overnight stay at a cabin), you can see pictures here (and thanks to Jeanine Rhemtulla's lab for this inspiration). A LUGE lab group project looking at urban agriculture has just been published! You can find it here. And just like that, he was gone! 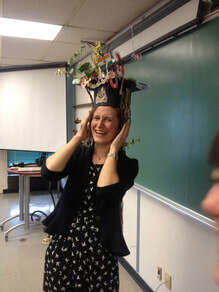 Dr. Toshichika Iizumi, a visiting scholar who has spent the past 8 months with the LUGE lab, is heading home to Japan. A crop modeler, Dr. Iizumi spent his time at McGill working on the impacts of climate change and variability on crop yields. It was great having you Toshi, we hope to see you again! 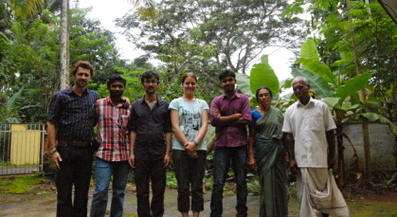 Fieldwork in Kerala: What and why? Our group is involved in two major new research projects. One is through a collaboration with the University of Minnesota’s Global Landscapes Initiative, through funding from the Gordon and Betty Moore Foundation, to improve our understanding of the relationships between agriculture and the environment. The second, GEOSHARE, is a collaboration between multiple institutions to develop a global, open-source, database on agricultural land use, environment, and poverty. PhD student, Verena Seufert, led a study published recently in Nature comparing organic versus conventional yields from 316 different paired observations. While the overall result was that organic yields were 25% lower than conventional yields, the organic-to-conventional yield gap was highly contextual. For example, we found that perennials and legumes had lower yield gaps, probably because of their better ability to deal with nitrogen limitations. Similarly, organic system performance was better in rainfed systems and in soils that were neither too acidic or alkaline. A news article published in the Proceedings of the National Academies of Sciences states global demand for agricultural products such as food, feed and fuel is now a major driver of cropland and pasture expansion across much of the developing world. Researchers, including Navin Ramankutty, examined pathways of agricultural expansion across major tropical forest regions. The researchers found that between 1980 and 2000 more than 55 percent of new agricultural land came at the expense of intact forests, while another 28 percent came from disturbed forests. Read more here or view the Stanford University News Release. Our research program was featured on Télé-Québec’s television program, “Le Code Chastenay" (émission 51: “Cartographe”). It was originally broadcast on Feb 9, 2010. A link to the video is available here. Science's "Editor's Pick of the Week - 20 April 2007"